Forget photo frames – photo holders are the next best thing! With endless possibilities of shapes, colors, patterns, and sizes, there’s just no stopping your creativity. That’s why we’ve rounded-up 30 of the best DIY photo holders for you to flex your creative muscle over. From animal figurines and disco balls, to holders made from clay, wood, gemstones and more – there’s sure to be a few projects here to get anyone’s heart in a flutter! These DIY triangular business card holders from A Beautiful Mess also double as awesome photo holders too! Paint them any color that your heart desires. Got any pretty gemstones lying around at home collecting dust? Why not turn them into one-of-a-kind photo holders, just as A Beautiful Mess has done? We think they’re stunning! Add some disco vibes to your space with these fantastic DIY mini disco ball photo holders. What a genius idea from A Bubbly Life! We’ll forgive you for thinking that these macarons are real, because they certainly look like it! A Kailo Chic Life created these using clay – we love them! Who knew that a simple block of wood could look so stylish? Add a slit to push your photo in and you’re done – thanks for the inspiration Apartment Therapy! These little DIY photo holder stands are so easy to create, plus we love the way that Ashley Ann Photography has added a deer to hers to make them even more special! Wow, these DIY faux marble photo holders look very stylish – who knew that they were so easy to make? Burkatron will teach you everything you need to know. All you need is a wooden door knob and come colored paint to create these fantastic DIY photo holders by Damask Love. They’re so on-trend! How great are these DIY wooden photo holders from Design Improvised? We adore the pom pom version! Guide Central has created a DIY heart-shaped photo holder and you can easily achieve this yourself using air-dry clay. So easy and affordable! These DIY star-shaped photo holders are quite fancy and we love the color scheme! You’ll want to check out the full tutorial from Handmade Charlotte to make them for yourself. Similarly to the previous design, Homemade Ginger has chosen to use heart shapes for her photo holders – beautiful! Using wire is also a simple and inexpensive material. If your colorful photos make you want to scream ‘yay!’ (much like these ones featured), then you’ll love making this DIY photo holder from I spy DIY! It would also be a fantastic gift for a loved one. A donut photo holder – need we say more? This quirky and delicious looking DIY photo holder from Kin Community is the perfect project to knock-over this weekend! These square DIY photo holders from Make and Tell use air-dry clay and we love the fun patterns that have been painted on them. You certainly won’t want to miss this amazing tutorial! Got some old spools hanging around? Turn them into these vintage-inspired photo holders, just as Miniature Rhino has done! They look fantastic when paired with black and white photographs. This DIY photo holder is so easy to make – you only need one material! Morning Creativity will show you how to craft your very own using colored wire. Sometimes, all you need is some natural tree branches to really bring Mother Nature into your home. Most Lovely Things has created these DIY photo holders with this idea in mind. They look great! 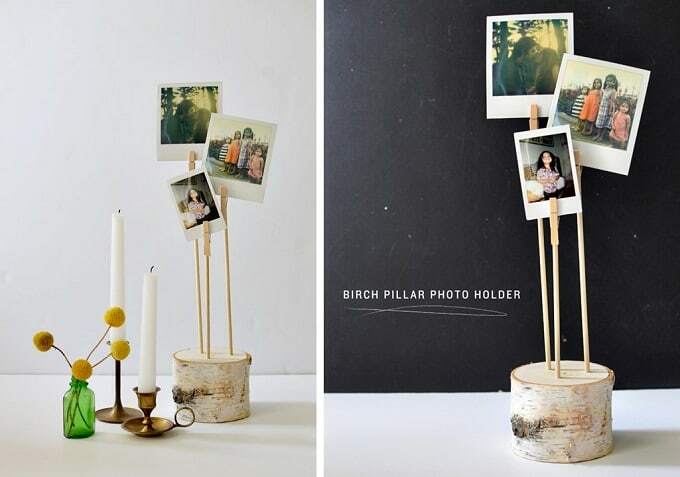 Similarly, My Cakes has created these DIY birch pillar photo holders to give her space a rustic but homely feel. The opportunities with photo holders are truly endless! How about creating these DIY finial photo holders from My So-Called Crafty Life? The step-by-step tutorial will provide you with all of the knowledge you need to recreate your own! Oh Happy Day has created these colorful and cute DIY cacti place holders, but we think they’d also make amazing photo holders! Place one on its own or cluster a few together for a quirky look. Passion Shake shows us how you can easily jazz-up some plain wooden blocks with colorful, geometric designs. What color scheme will you choose? Add a coastal luxe feeling to your home by creating these DIY photo holders from Photojojo. What a clever but affordable idea to bring the beach home with you! Shrimp Salad Circus simply decorated some large wooden pegs to create these DIY photo holders. We adore the vintage botanical touch too with those floral designs! Smile and Wave has created what she likes to call a ‘You’re a Gem’ photo holder. We adore the geometric nature of this project and think it’s perfect for adding style to any space in your home! Although originally created for Easter, we believe that these DIY egg photo holders from Sugar and Cloth can be used all-year-around, don’t you? The geometric shapes are very on-trend! Does it get any better than gold animal figurines? Personally, we think they’re a cut above when they’re able to hold photos too! Check out the full tutorial from Sugar and Cloth. Possibly our favorite DIY photo holder design, Sugar and Cloth has created these gorgeous mountain designs from clay. The gold adds a very nice touch! Wooden shapes and vivid colors – what a wonderful idea from The Crafted Life! We bet these are incredibly easy to make too. How great are these DIY dino photo holders from Three Little Monkeys Studio? Children will love these fun creations and the good news is that you require very little craft skills to actually create them – they’re perfect for beginners! There you have it – 30 amazing DIY photo holders that are both fun and easy to make! Which projects are your favorite? We’d love to hear from you in the comments section below.